For most of the homeowners, remodeling project of expanding outdoor living space has become a top choice. Such projects often need upgrading with better-quality materials, which normally means considering many different varieties of composite or alternative-material for deck boards available in the market. Composite fiberon decking can provide longer life and low maintenance. However, they are not all created the same. Following are few key tips for your project that you may consider while deciding the best choice. Composite deck boards are costlier than wooden boards but remember the long life that deck can offer with no chances of mold, splinters and rot. You will never change the boards with little chance of staining, sanding or resealing of your deck. Higher-quality boards may marginally increase your project cost but can pay back over the years. Mostly composite boards have varying mix of wood, vinyl, PVC and/or recycled plastics. Few varieties may not contain any wood or PVC, rather uses recycled carpet fiber to increase durability. Plastics variations may react differently to moisture, freeze-thaw cycles, UV rays and any other factors, so research about the constituents of the deck material. Few deck materials need special fasteners or tools. Most composite boards don’t need same screws like wood boards. Fasteners also may create stress at the edge of any tight fastener. Manufacturer usually provides approved list for hidden fasteners and face-screws and also application techniques. Are you located near sea side? How much is the temperature variation during the winters and summers? Composite materials too are subject to certain weather changes. Learn about specific expansion or contraction rates of material. 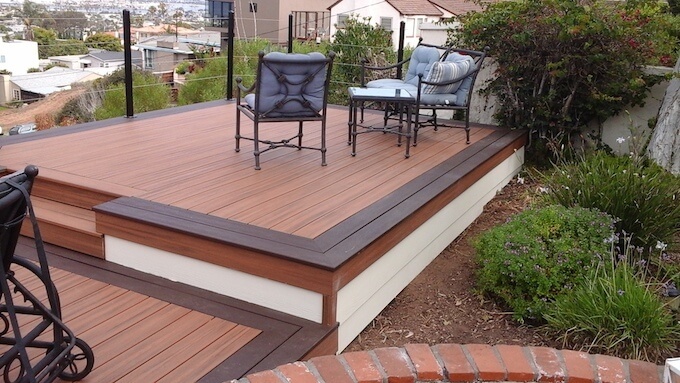 It is one key reason why contractors get callback after completing any deck projects. This information is also obtainable from the manufacturer. All products are not available in all possible sizes. In case of more complicated decks, you need to look for products which offer longer length and spanning capability to provide more design flexibility. Try to avoid waste while cutting pieces, in order to reduce the framing cost. Homeowners may have many more options today while selecting deck boards than before. Search them out and educate yourself about various pros and cons about each of your choice. This will help you to ensure that you will get the best deck meant for you.